Virgin Atlantic check-in is positioned in Zone A at Terminal 3 at Heathrow. The space is easy to identify with massive logos visible from the drop-off forecourt, and once in the terminal, there are numerous signs with the various check-in counters, as well as an abundance of self-service units. There are some meet and greet staff available to deal with immediate enquiries, and for Premium Economy customers there is the benefit of dedicated priority check-in which is simply branded up as “Premium”. Service at the counter is probably the weakest element during this flight experience – it is totally efficient, but there are no niceties, and I am simply directed to look at the information screens for my gate allocation at the service closing. Boarding begins 45-minutes before departure with priority customers called first. 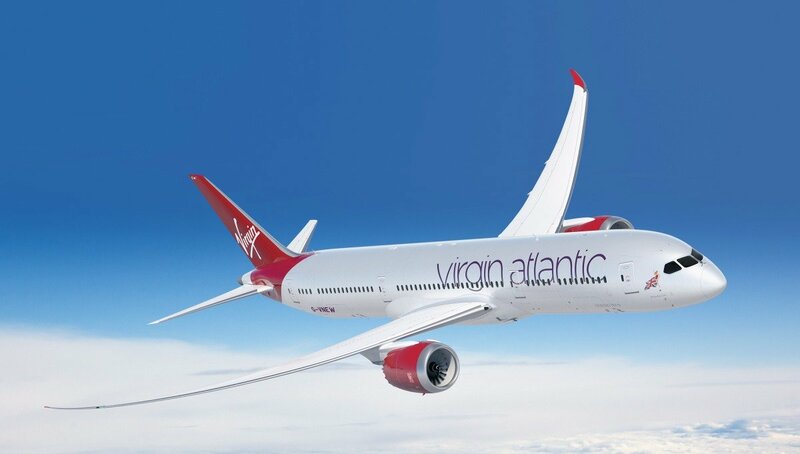 This includes Upper-Class cabin passengers, FF members and handily, Virgin also include Premium Economy in this category. The welcome at the door sets a good first-impression and combined with simple purple mood-lighting and attractively laid out bar area (for the Upper-Class cabin) there is a prestigious feel. I am quickly seated in the bulkhead row, and the cabin crew are swift to provide drinks (prosecco, water and orange juice), and these are kept topped up throughout the boarding process. Newspapers shortly follow and individual menus. Overall, it is a positive start for today’s flight to Seattle, and not too dissimilar to a decent regional Business Class flight in Asia or the Middle East. The cabin staff during boarding are chatty and effusive, and there is a sense of the party vibe that is often portrayed in the airline’s marketing. The boarding music is a mix of modern and classic pop/rock tunes, and this is a nice alternative to the repetitive Muzak delivered by many airlines. There is a useful route update and welcome from the flight deck in advance of the safety display which is most welcome. Boeing 787-9 in Premium Economy which was close to full. 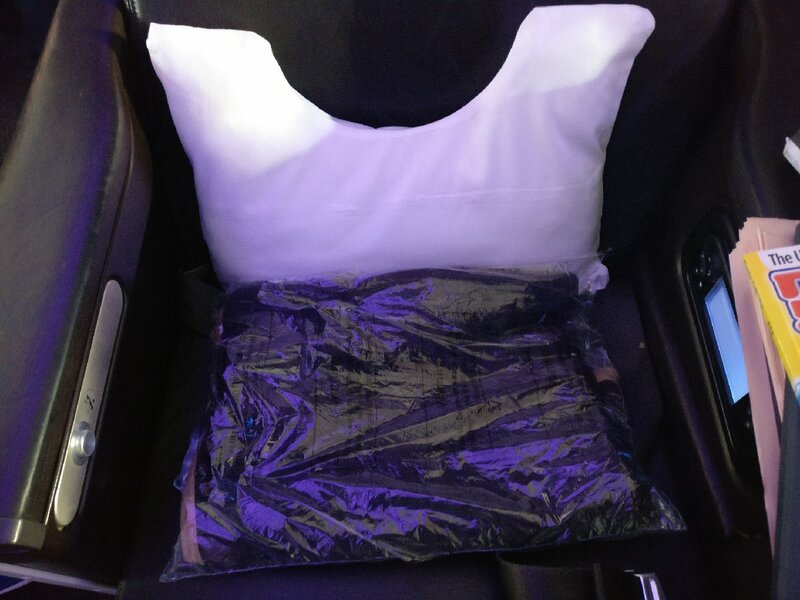 In Premium Economy, customers can take up to 2 pieces of baggage, and these can each be up to 90x75x43cm (35.5×29.5×16-inches) and 23kg (50lb) in weight. For hand carry, this should be 1 item at a maximum of 23x36x56cm (9x14x22-inches) and 10kg. A handbag, rucksack or laptop bag is permitted in addition to the above. Today’s flight is on a 4-year old Boeing 787-9 in Premium Economy which is configured with 35 seats in a 2x3x2 format. I am in seat 21G which is an aisle seat in the bulkhead row. The obvious inconvenience of the bulkhead is that this is just behind the galley, Business Class bar and washrooms, so there is high-potential for intrusion. The benefits are extra knee space and the fact there is no dreaded invasion from a forward seat. All seats are upholstered in a nice looking dark brown leather, and the visual appeal is high. For standard seats, the seat pitch is 38-inches with a width of 20 inches between the armrests. The personal space is excellent. There is a large full seat width headrest which has up/down adjustment – there are no covers, but this does appear to be clean. After departure the cabin crew provide large leather footrests for those customers on the front rows – other seats have the more traditional fold-down facility. The tray table deploys from the armrest and covers the full seat width – this is bi-fold but sturdy and gives excellent utility for my planned work during the flight. There is a USB socket integrated into the PTV screen, and there is a 110v International outlet for larger devices under the seat. In the bulkhead, the USB location is an annoyance as to use and customers must either deploy or semi-deploy the PTV screen for access. These seats all have personal air vents which means that the cabin temperature is comfortable for the flight to Seattle. Cabin cleanliness appears satisfactory onboarding and all primary contact areas around the seat are clear and free of debris. There is some coffee-ring staining to the tray table when this is pulled-out but the fact that the mood lighting is quite subdued and dark means that this is only seen after departure when there is more illumination. Similarly, there are some small marks and chips on the central console which again, only show-up in the brighter cabin lighting used during the meal. The cabin design is contemporary with dark seat covers and carpets, and the main colouring is from the mood lighting which is well used for this late morning departure. The bulkhead wall panels are enhanced with a modern geodesic design. There are 2 washrooms at the front of the cabin that are for use by Premium Economy customers, and Virgin also employ curtain dividers between Upper Class and standard Economy, so there is a good sense of exclusivity within the cabin. The washrooms are outfitted with the usual design for the B787, and like the cabin, this is finished to a good standard. One disappointment is the lack of amenities in the toilets, and this constitutes basic pipe soap for today’s flight, and one might expect a little more for this premium cabin. The flight departs 30-minutes late from Heathrow due to weather-related ATC issues and arrives into Seattle more or less on time after a journey that is just over 9-hours in duration. Service begins in a flurry around 15-minutes after departure with a pre-meal bar cart. The trolley is well-stocked with a wide range of mainline spirits, red and white wine from Spain. Soft drink choices are similarly extensive and include more niche items such as ginger ale, cranberry juice and sparkling water which are not always found outside of the front cabins. There is a bar snack of sour cream pretzels from a well-known global brand. Drinks are presented in proper glassware, and wine comes in stemmed design much the same as you will find in any regional Business Class cabin. 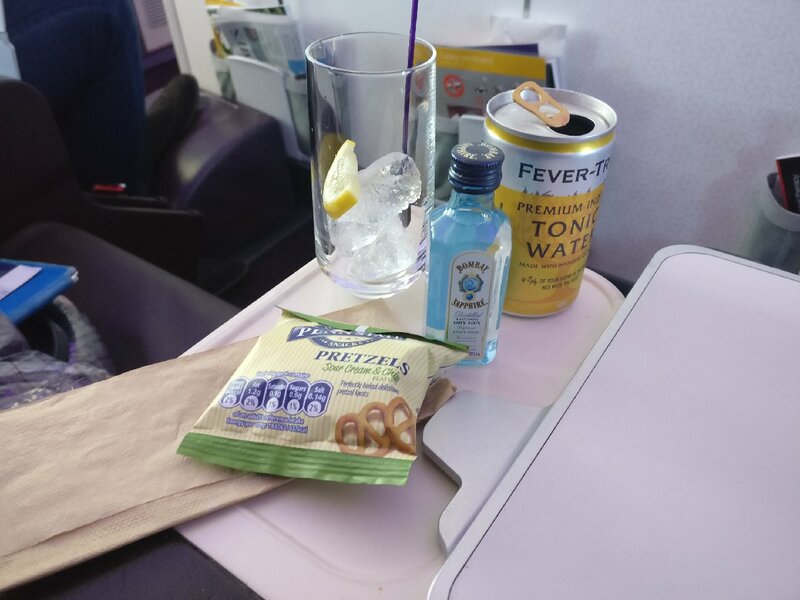 It is a pleasant surprise that the product is continued for the mid-flight drinks where customers may avail from chilled tumblers in the galley display – which seems to be lieu of any ice provision. The meal tray is delivered around 25-minutes later, and there is a choice of 3 entrées (beef meatballs with pasta, coq au vin and mushroom risotto), and to begin there is an orange and walnut salad and dressing, and a blueberry cake for afters. Cheese and crackers are also present, and the butter portion is from a high-street brand. Bread is seen being given to other customers, but I am not offered this item, so the is quality untested. The food is quite excellent, and the product sits somewhere between long-haul Economy Class and regional Business Class for flavour, texture and presentation. The most noticeable upgrade is the china and glassware used on the meal tray, which is also nicely dressed with a linen cover. Proper quality metal cutlery is in the napkin roll, and as discussed, glassware is used for water and wine. Staff are somewhat active in the cabin during the meal toing and froing with drinks, and there is a moderate degree of ad-hoc tray clearance for those customers that finish early. Tea and coffee are served from a cart, and this is nicely enhanced with a large china mug. 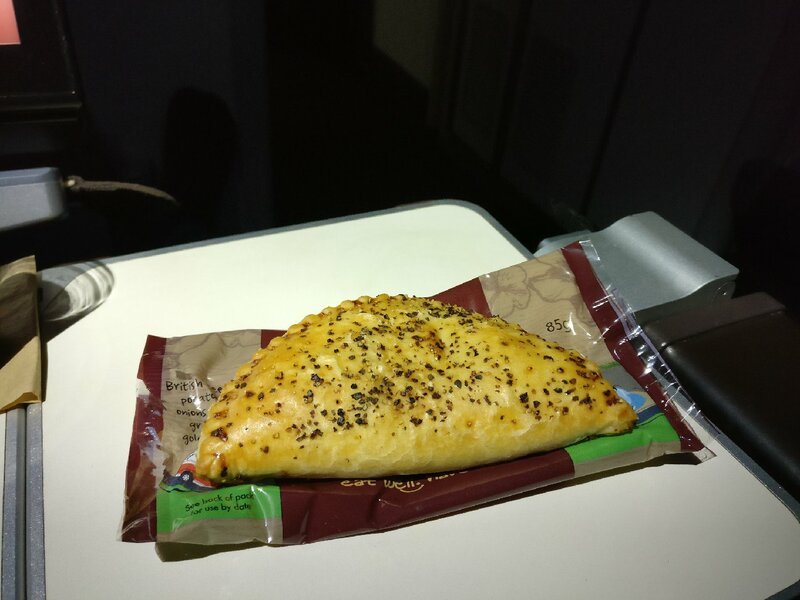 Mid-flight staff serve mini-ice creams and peppered steak pasties which both have fine flavour. There is also a purpose-built bar area for Premium Economy passengers to pick from which Virgin name the “Wander Wall”. 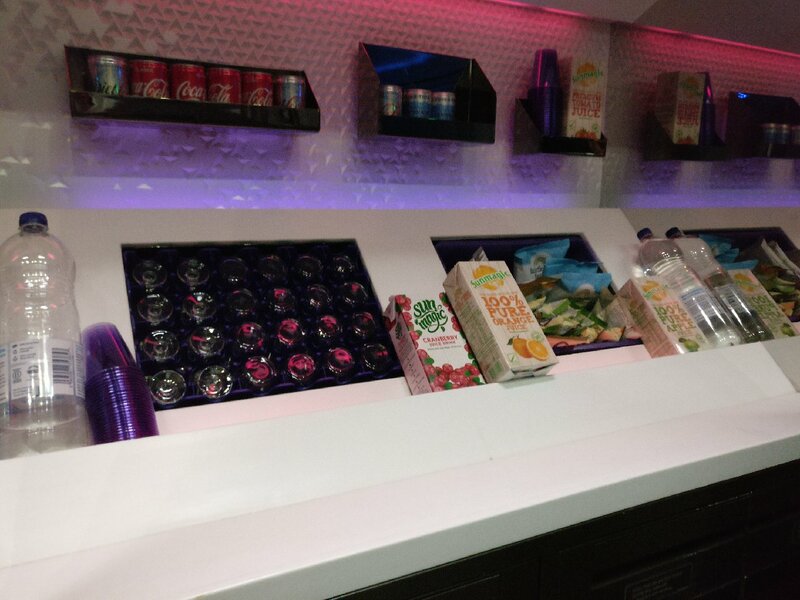 This is well-stocked with a range of packet snacks, soft drinks and water, and the staff seem happy to provide other drinks from the bar menu to those customers that want these. 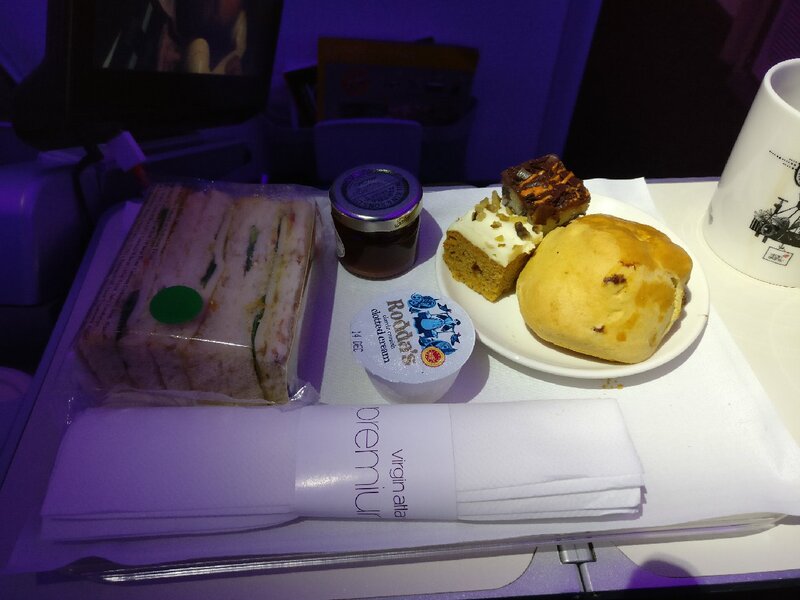 Before arrival, there is an afternoon tea style service with a trio of finger sandwiches, petit four cakes and a plain scone with jam and real Cornish clotted cream which is a nice taste of home before arriving into Seattle. 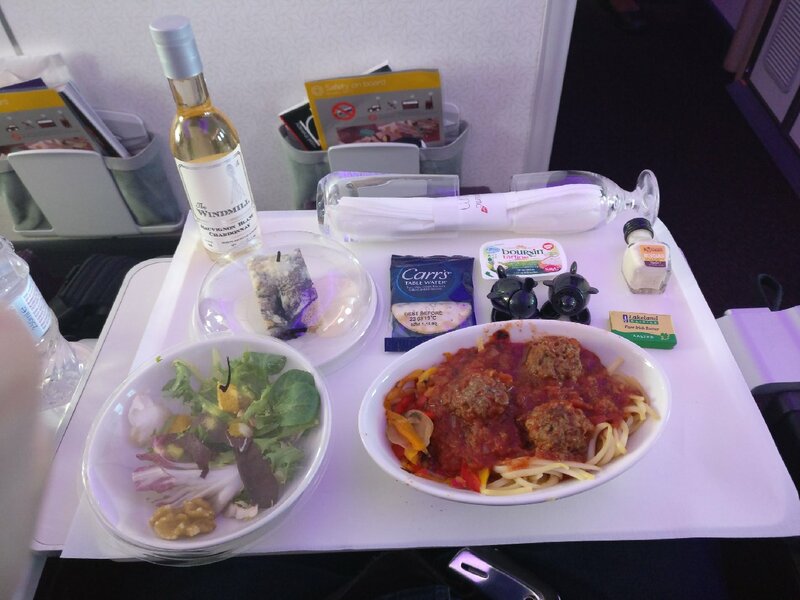 Given the flight length, one cannot grumble at all about the quantity of food available, and based on this experience, don’t expect to go hungry or thirsty in the Premium cabin. Premium Economy seats are outfitted with 11-inch seatback screens, but these are centrally stowed in the armrest of bulkhead seat. 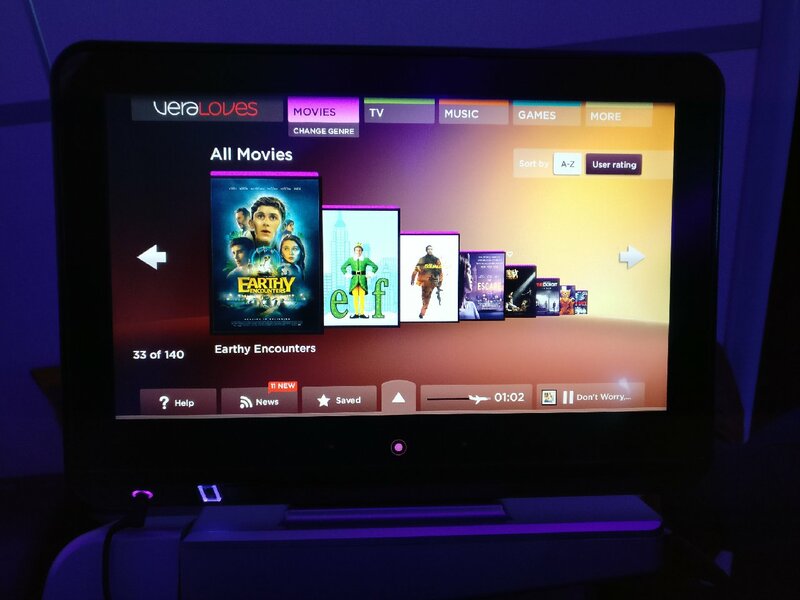 The system is branded up as Vera – Virgin’s trendy moniker for the interface and accompanying IFE guide. The functionality is quite simple with the core categories of movies, TV, music and games on the top banner and a with a further “more” menu which is a catchall for most other items (think destination guides, flight map, seat chat, news and suchlike). From the main menus, it is possible to filter into numerous sub-categories by genre. Today Virgin has on offer 140 movies, 123 TV options and approximately 400 albums. In the movies section, there is a fair mix of new films as well as older classics, around 20 world films and 14 for kids. Of the TV options, 25% are boxsets with the full-season, and this has reasonably current content with some back-catalogue choices. There is other mainstream programming with a handful of episodes and varied range factual, sport and kids’ options. There is no live TV news – however, there is a pretty decent news feed which is updated regularly during the flight with various business, sports and entertainment stories. WiFi is available in 2 packages £4.99 for 40MB and £14.99 for 150MB. While I managed to run off a single 40MB on this 9-hour flight, this was achieved by disabling any auto updates/uploads on my phone and only using the service for messaging and a very small number of emails. It’s not the worst value out there, but customers are unlikely to have the free-flowing web experience that is possible with the often more generous time-based allowances. Curiously, there isn’t a traditional inflight magazine, but the IFE guide is extensive and contains some articles so serves a quasi-option for this item. The content is reasonably interesting and obviously gives an excellent overview of the system content. Always the rebel, Virgin is bucking the industry trend of airlines that are maintaining the conventional inflight publication but ditching the entertainment guide. There is the usual tax-free sales brochure for those customers wanting inflight shopping. Each seat is outfitted with a pillow and blanket during boarding. The blanket is black with brown trim, and this is constructed from the thinner fleece-style material that is becoming popular amongst many global airlines. The pillow is white and has a white cotton cover with a small cut out to fit more ergonomically around the neck. It is a bit flat if one is to be highly critical, but it is pleasing nonetheless to have a proper cotton cover. Virgin does not give any amenity pack (eye mask and suchlike) on daytime flights, and in consideration of the time difference (it is 0245am in Seattle at the time of departure), this seems somewhat thrifty given many customers do catch some sleep before a sociable lunchtime arrival for the day ahead. Staff service begins well during boarding with much of the well publicised, spirited approach on full display. It is a style of interaction that may not appeal to all passengers, but it is delivered with warmth, and as long as one doesn’t mind being addressed occasionally as “love” or “my darling”, it should not offend. Efficiency during the main contact points is all quite satisfactory with drink and meals delivered with good speed, and there is decent attention to clearing away the litter. The discipline and skills are not at the level one will see in Asia and the Middle East and sitting close to the galley numerous items are being dropped during the meal service which is sometimes followed by rather colourful language. However, it is a difficult item to criticise as the overall outlook of the front-line interaction is quite enjoyable and pleasing, and this more than makes up for these minor service failures. Service presence and energy does decline somewhat as the flight progresses, litter clearance is not as frequent, the second meal tray is slow to be removed, and perhaps most importantly washrooms become quite messy and stocked low with tissues and towels. However, overall, this is genuinely one of the more enjoyable Transatlantic experiences I have had with any airline, in any cabin. Staff presence for arrivals is quite satisfactory, and given the connectivity with Delta Air Lines, there is reasonable assistance for transfer customers. Immigration processing is quick today, and bags begin to arrive shortly after this. For those customers connecting, the transfer and re-check counter is positioned just after customs, so the process is as easy and streamlined and as one can expect in the US. It is important to note, due to restricted space on the terminal train between customs and the arrivals building, International passengers going to the city must put bulky luggage back into the baggage handling system to be recollected on a second delivery belt in the domestic area. It usually does not add much in the way of time, but nonetheless, the system is unconventional. 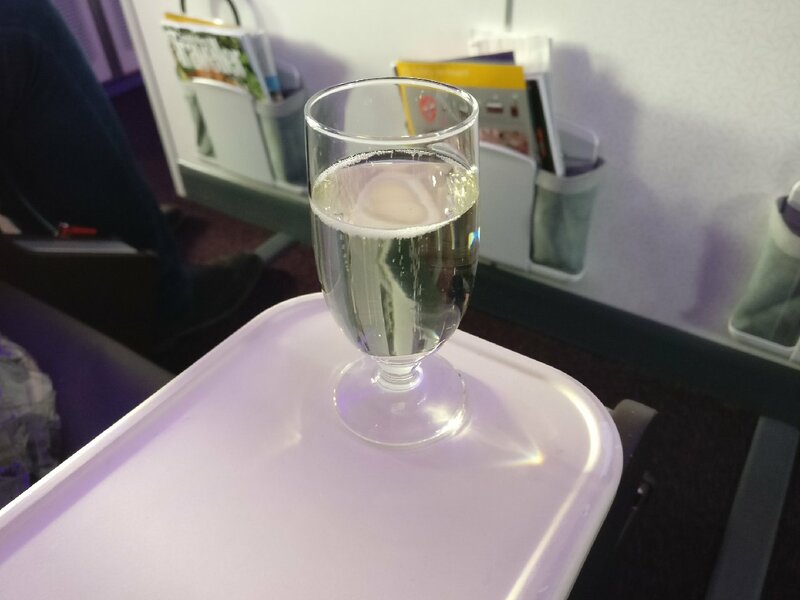 Overall, very happy with this Premium Economy experience and Virgin Atlantic has struck a fine balance between Business and Economy Class for the product and service offer. While the style of food provided is broadly aligned with the back cabin, the hardware on which it is delivered is nicely upgraded, and it is these small touches that one is now seeing more in Premium Economy. The seat is decent and provides all the expected mod-cons for comfort and working. 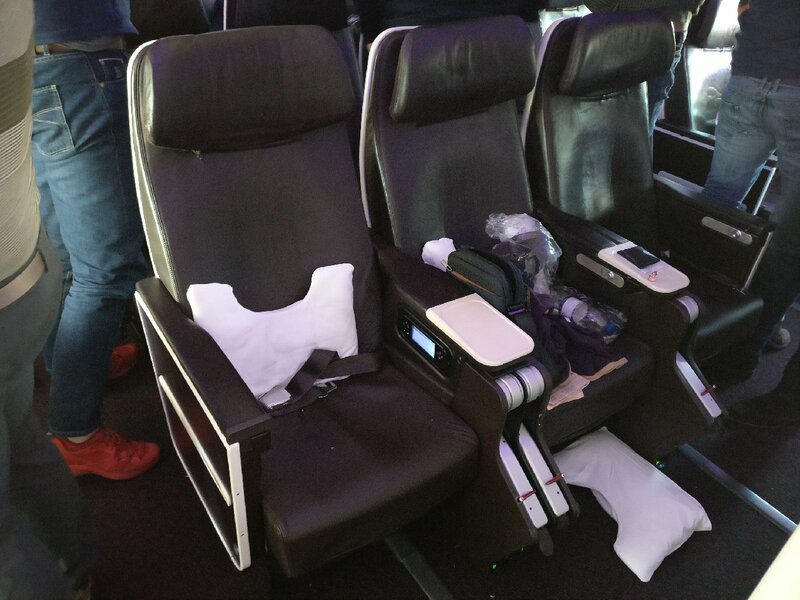 Having experienced most of the major European airline Premium Economy cabins, Virgin Atlantic sits well alongside the best of them – however, this is with the caveat that this flight was on the airline’s newer Boeing 787-9 aircraft.